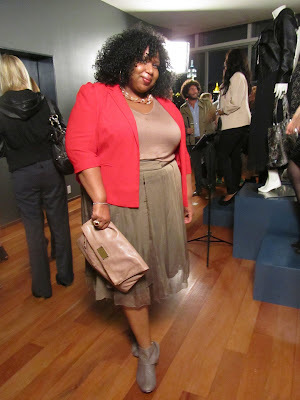 This past Wednesday, The Limited hosted a launch event for their new plus collection Eloquii. The event, hosted by Gabi Gregg of popular blog, GabiFresh, was held at the Cooper Union Hotel in Manhattan and honestly was a very pleasant surprise. 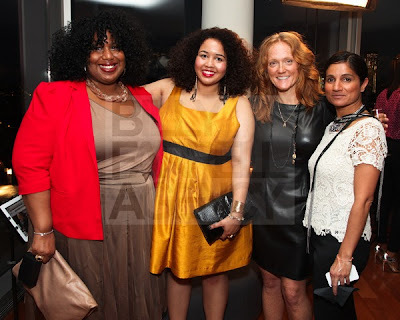 Below: Me, Gabi Gregg, Jodi Arnold - VP of Design at Limited and her lovely Assistant. What I took away from the event is that this is a brand that is genuinely interested in getting it right. Though the collection is mostly Career, there are sprinkles of separates that I would incorporate into my wardrobe. I liked pretty much everything but liking things and actually wanting to wear them are a little bit different for me. Eloquii's first collection is attractive, fashion forward and what I like most about it is that, for Career wear it's full of bright colors, snazzy patterns and spot on trend silhouettes. Here are three models from the launch event in a few of my favorite looks from the collection! This is a look from the lookbook that I actually really loved. I'd definitely wear this top! The site launches this coming Tuesday, so no matter if you're a career gal in a conservative office, like to punch up your work clothes with bright colors and fun pieces or more like myself which is much more bold in my choices, I think pretty much anyone could find something they like. Check out www.eloquii.com next week and let me know what you think!